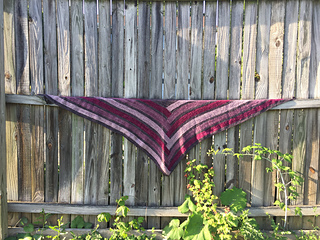 HUMPHRY is a wide shallow triangular shawl suitable for many yarn weights. You can stop at a cute little shawlette or go on and produce a cosy blanket like shawl. It is knit all in garter stitch but avoids a garter tab cast on. It is a basic log cabin design but without the need to pick up stitches (and the ridge that produces on the reverse). By varying the size of sections it can be made more, or less, symmetric. This and the many combinations of yarns that are possible make for a shawl you can stamp your own individuality onto. Thanks to Lina Knits for tech editing. Thanks to Lynne190, Leelang, Ruhammie, Teenuh, and ashenaloewin for test knitting. Thanks to misstwilight for general hand holding and talking me down from the trees.